I'm a mother, wife, sister, daughter..well you get the picture. I wear many different hats. I have 2 beautiful daughters who are the apple of my eye, depending on their moods. I'm also an avid crafter. 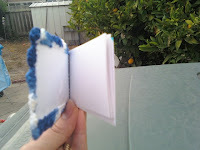 My hobbies of choice are knitting, crocheting, cardmaking and soon to be scrapbooking. Crafting allows me to try and dig deep down inside of me and try and creative something from the heart. Hobbies include crocheting,knitting,scrapbooking and reading. This book started out really good but got dreadfully boring and jumped around too much. I quit reading it 75% of the way through. Due to a recent critique I received on my main shop I decided to try my hand at opening a 2nd shop over at etsy. 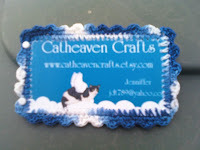 CatheavenCrafts will be my knit and crochet store. While CatheavenCreations will feature my papercrafts and misc crafts. I will test this out for a bit and see how it works out. If after a few months I don't notice a significant change to my main shop then I'll combine my shop again. It will take a bit before I get the 2nd shop up and running due to the fact of deadlines that I have. Please feel free to stop by both stores and take a peek. So the other week I asked some friends what they might like to see if they were to receive a box full of handmade samples. Thank you to all who answered. After many days of brainstorming trying to figure out how I can easily make something that would incorporate my etsy shop and what I sell I came up with this idea. I took my love for crochet and combined with my papercrafting and came up with this new take on the matchbook note sets that people make now. To advertise I used my business card as the cover page. In the future I will be making some new sizes and styles which will be up over at my etsy shop sometime in the near future. I'm a little iffy putting them up on etsy only because I checked over there and I haven't seen (or can find) this idea up there. I shall see though. I think these would be great to carry around in your purse or bags. They'd also make great and useful gifts in party bags. Drop me an email if you ever need some. I'm pretty excited about them. They actually aren't as quick as i had hoped they be but they're quicker than knitting a dishcloth. I'm very happy with them! leave me a comment about what you think of them!